Paper is the most recycled material in the world today, with recovery rates ranging from 60 to 72% in North America and the EU. Over the next 15 years, paper for recycling is expected to grow from 43% to 61% of total global fibre supplies. incinerated]; contributing to carbon sequestration ; reducing the amount of energy needed to produce some paper products; and saving considerable landfill space. 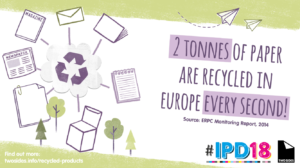 More than 57 million tonnes of used paper are collected in Europe. The collection rate of paper for recycling is constantly increasing, exceeding 60% every year since 2005. Main sources of paper collection: 50% from trade and industry,40% from households, and 10% from offices. Future potential: mainly through households and offices, industrial sources will increase due to the expected increase in use of paper and board in packaging, taking over from single use plastics, making sustainable forestry and the recycling of paper work positively for the environment.